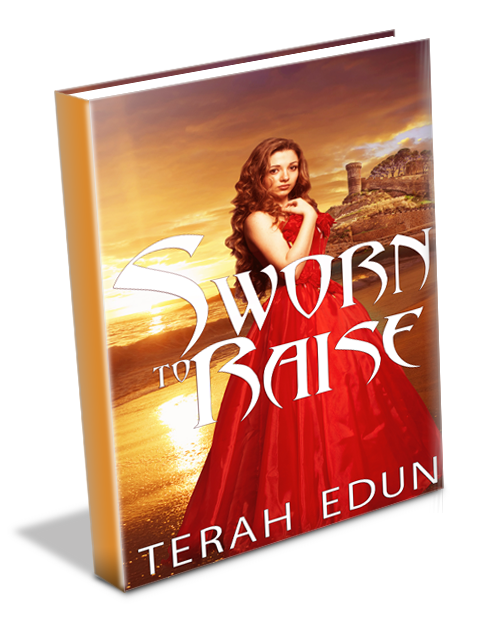 Sworn To Raise is Free on Amazon, Barnes & Noble, Google Play, iTunes, Kobo and Smashwords! Sworn To Raise is now FREE to everyone who wants to start the Courtlight series! So tell you friends who just got a new Kindle, a new Nook, a new iPad, a new Nexus or a new Kobo – here’s your chance to read an amazing high fantasy series at no cost! And check the end credits of the book for a special reader’s only promotion! When they’d walked far enough from the crowds Margaret was quick to tell Ciardis the news that she’d heard from the weaver’s daughter who’d heard it in the apothecary the day before. At this point Ciardis was staring off in the distance – hand pressed flat against her stomach as if by holding it she could keep her stomach from plummeting in despair. Minutes later the town bell rang signaling that the highwayman had been sentenced and imprisoned. Everyone would be going back to work now. Mind numb Ciardis trailed behind Mags, trying to comprehend how her life had just upended. When she got back to the wash room Ciardis bent over the soapy tub, mind numb as her hands worked mechanically to scrub the red jerkin. Margaret knelt across from her, happily chattering away like a magpie. According to Mags, the miller’s son had gotten some passing girl with child. The news had spread like wildfire after the fool had stumbled into the local apothecary’s asking for honey’s brew. Every woman in town knew that there was only one use for honey’s brew, and it wasn’t to sweeten tongues. If the girl had been an orphan, like Ciardis, her swelling belly wouldn’t have mattered much. She would have borne the brunt of the town’s gossip for the winter months and gone home with a second mouth to feed after the snows melted. But the girl’s father was the caravan driver for the only merchant willing to brave the fierce winds of Vaneis in the winter. He’d heard someone’s tongue wagging and had confronted the girl before the honey’s brew had passed her lips. Frantic once he’d heard the truth from his daughter’s lips, he had gone in search of Fervis Miller. Whatever words had passed between the caravan driver and Fervis over his daughter’s ‘condition’ had been enough to get the message across. Fervis, bruises already darkening on his skin, had shakily gotten down on one knee before five witnesses and asked the girl for her hand in marriage. The wedding was to take place on the dawn of the Sabbath – just three days hence. Ciardis frowned contemplating going to their wedding – she would have to. Weddings were one of the few forms of entertainment in town, if she didn’t go it would definitely take notice. She didn’t care. Honestly, she didn’t. If that idiot couldn’t keep his stick in his pants, then he didn’t deserve to wear her ring. Wringing out the last jerkin, she twisted it like she was wringing a stubborn turkey’s neck. Or, better yet, Fervis Miller’s. She wiped her hands with a drying cloth, careful to prod Mags for more tidbits at the right intervals. She had finished washing the jerkins and Mags was done with the skirts she was scrubbing. They put them out to dry before the oven fires and then moved on to fold the huge stacks of tunics and pack them in the caravan trunks with dried sprigs of fresh mint. Ciardis thought about the stolen moments she’d had with the miller’s son. In the summer, they’d picnicked in the meadows, and throughout mid-winter he’d held her waist as they flew across the ice of the secluded mountain ponds. Memories of the soft touches exchanged and the ardor in his voice when he’d promised that he’d petition for her vows were still imprinted upon her mind. He’d promised over and over that he’d convince his mother somehow that Ciardis, orphan girl with skin the color of pale pecans and unruly chestnut curls, was the young woman that should be her daughter-in-law. Ha! Last spring, she and Fervis had even hatched a plan for her to bump into his mother as she left morning prayers at the church. They’d painstakingly played out the scene while laying on fresh hay in the cobbler’s bard. When the day to bump into his mother had come Ciardis had tried to strike up a conversation. But from the moment the conversation began, it was clear from the rancor in the woman’s tone and the disparaging look in her eyes that she considered her son’s marriage prospects, far above the town’s orphaned girl. Guess she was right, Ciardis thought with irony, He’s going to get a caravan merchant’s daughter who lifts her skirts for the first young man she sees instead. Frustrated and tired, Ciardis threw her basket of clothes down on the floor with such force that she startled Margaret right out of her monologue. “What’s with you?” Mags asked, dark eyes wide. Inside she was seething, calling Fervis every dirty name she knew. She’d wasted two whole years on that idiot. Two years of listening to his constant whining about grain prices and the boring bakery gossip in his uncle’s shop. She’d set her sights on him at age fifteen. He had been boring then, and he was boring now, but she could live with boring. What she couldn’t live with were the pangs of hunger after an evening with no meals, a month without meat, or the backbreaking work of being a temporary field hand. With a man like Fervis, set with a steady income from being in a miller’s family, Ciardis could have a life of leisure…or close to it. But now thanks to that lout she was ruined. Here she was, seventeen with no nest egg or dowry to buy a husband, and she’d already snubbed every boy within twenty miles to show Fervis her devotion. Her devotion, for crying out loud! Fat lot of good it did her now. After finishing the last load of laundry, she eased out of the hot sauna room and into the outer chamber where Sarah, the dour head cleaner and accountant, kept the tally chips. The tally chips were small marks color coded for a task. A red chip for hard to clean garments like the red leather jerkins, a blue chip for folding a basket, a green chip for pressing and ironing. She counted hers as she walked down the hallway to Sarah’s office. Today she’d washed three loads by hand and pressed and packed a further two. That was just enough to get her a decent tally at the end of two weeks’ work. She had to pay the innkeeper soon. Handing the chips over to Sarah, she waited impatiently in front of the scarred wooden desk. The woman took forever with anything, particularly when that anything involved money. She squeezed the last shilling out of every washing cloth and piece of soap she bought. At last, Sarah handed over her payment and she went home. She even had a few extra coins, enough for a small bowl of soup with bread—huzzah! Since she could pay in cash she didn’t have to worry about adding tonight’s dinner to her tab, then. The innkeeper was a pleasant man, but he always charged interest to the month’s tab when she did that. She was freezing by the time she stepped into the warm inn kitchen, even though she was bundled in three layers, with woolen pants on under her skirts. Rushing to the fire, she warmed her chafed hands over the flames. Out of the corner of her eye she saw the only male waiter for the inn rush in through the swinging panel doors from the tavern. From the noise that wafted in behind Kelly the place was packed with journeymen. Must be that caravan that’s on its way out, she thought as she nibbled on a cracker she’d filched from a side table on her way into the kitchen. Kelly began to hurry out just as fast carrying a platter filled with hot mutton and an empty kettle which swung erratically from his hand. She ducked to dodge the errant kettle and said irritably, “Watch where you’re going, Kelly, you big lout! You almost brained me.” Ciardis pushed her scarf back off her silky mane as she straightened up, scowling. “Sorry, lass,” Kelly said, already rushing through the swinging panels and into the tavern. Noise flooded through the open doorway. Must be a large crowd tonight, Ciardis mused. She caught his meaning, all right. “Thanks for the warning,” she said gravely. Grabbing two pieces of fresh baked bread and a bowl for soup, she had the tavern maid dish out the soup under the watchful eye of the cook. Paying for the meal she grabbed a spoon and left the kitchen. She decided to take the back stairs with her lentil soup and bread. She navigated the creaky flight with her satchel digging into her back, balancing her plate in both hands. She ate as soon as she’d opened the door, ducked into the stuffy darkness of her room, and then eased down on the lumpy bed. Ciardis went to sleep not long afterward, still furious about the miller’s son, but a tiny twinge of self-doubt also fluttering in her belly. At half past midnight, a sound broke through Ciardis’s dreams and sent her lurching out of bed. She’d heard the light creak of the stairs outside her door. Frowning, she threw off the heavy covers and grabbed the knife she’d hidden between the mattress and wall. Must be a drunken soldier. Her room was barely big enough to stand in, with a sloped ceiling and a mattress that took up most of the floor. If a soldier cornered her in here, there was no way she’d be able to fight back…except for the six inches of steel blade in her hand. Best to avoid the situation altogether. Thinking of her options she knew the roof washer was her only bet. It’d be tricky to maneuver to get up there while holding something but Ciardis quickly decided that she’d rather have the knife in her hand than in her belt. She quickly grabbed the rickety stool in the corner and pushed off the accumulated clothes to the floor. Standing on it with the knife in her right hand, she reached up and pushed at a panel in the ceiling, easing it up and placing it next to the opening. She gripped the edge of the ceiling with both hands and swung herself up and over, then slipped the panel back into place. Now she stood in the small crawl space between the room and the roof. It was insulated as well as it could be but the ceiling still leaked warmth in deep winter. Even with the leak, at times like this, she was glad she’d never gotten the panel fixed. It made her claustrophobic to think of being stuck in that little closet of a room with no fresh air. Careful to move silently she grabbed the tarp that latched over a hole in the roof that had never been fixed and eased out the nails that held in place. Leaving the ceiling panel loose and tarp in place had numerous downsides…but in this case the advantage of escaping her room more than outweighed them. As soon as she wiggled through the small opening, the bitterly cold wind chilled her to the bone, even though she was still dressed in layers. Her fingers began to feel numb. Trying to evade the chill she hastily rearranged the tarp and fisted her hands in order to pull back her trailing fingers as far as she could into her sleeves. Unfortunately that wasn’t going to work for very long. She’d need to use her hands at some point. It must be close to the freezing point, she thought while her teeth chattered. Her little room had a heat spell on it to ward off the worst of the cold, but out here she’d freeze to death if she wasn’t careful. She couldn’t hear anyone in the hallway now, but that meant nothing. Making a quick decision, she headed across the roof toward the stables. It wasn’t the best place to sleep, but it was better than being raped, and Robe would look after her there. The steep roof had peaks that rose up into the night sky and furrows that dipped sharply to help the accumulated snow slide off more quickly. That also meant there were a lot of snowdrifts at the wall base and, even worse, ice. She cursed under her breath as she struggled to maintain her footing. She saw the irony in escaping a drunken soldier only to bash her brains out on the ice below. Upon reaching the roof’s far edge, she carefully descended an ice-slick ladder to the walkway that connected the inn’s second floor to the barn’s upper level, where they kept the pegasus stalls. Hurrying now, she soon reached the welcome warmth of the stables. As soon as she stepped inside, the straw dust hit her allergy-sensitive nose and made her sneeze. Those allergies, especially in the spring with the dust and dandruff, were a dangerous combination. Consequentially, at any time of year, but particularly in high pollen season, the stables represented her refuge of last resort. Ignoring her discomfort for the moment, she headed for the opposite end of the row of stalls, where the stable manager’s quarters lay. That was where Robe lived. He was a man twice her age, but with the mind of someone much younger. He loved animals, and they loved him. She shook her head silently, shivering. It was a simple-minded mentality but worked well for Robe and the stable owner. Garth had decided that a man with half the intellect of the others and a childlike enjoyment of the animals would be less likely to run off. He’d given Robe a home at the stables, steady meals and a few coins once a month for his services in training and caring for the pegasi. In Robe’s eyes it was a good trade: his skills in the stable for a home. In Ciardis’s view he’d been robbed of a proper income. But at the same time, she’d hate to think of what might happen to him on the streets. Easing the door open, she sidled into the office area, which Robe used as his “pretty things” room. It was half-filled with rocks he’d picked up, shirts he refused to wear but loved to look at, and bright scraps of cloth pinned to the walls. Sometimes he kept colicky foals in here, too. Once he’d kept a baby snow leopard for a month—even built a nest for it. How Robe had managed to catch the dangerous creature, even a baby snow leopard had claws that rivaled the knife in her hand, and convinced the pegasi to keep his secret she would never know, but once Garth, the innkeeper, found out about the cub, all hell broke loose. It had taken some convincing, but Robe had handed the cub over to the innkeeper. Garth had told Robe he was sending it to a sanctuary, but really the innkeeper had sold it to a noble idiot who liked to keep dangerous pets. Ciardis went over to the wall nook where Robe kept a couch. Carefully putting aside a pile of brightly colored shirts, she slid down onto the couch and curled up for an uneventful night’s rest. She woke to find a bowl of cooling porridge on the floor near her dangling arm and pale sunlight shining down on her face from the narrow window. With a wry smile, she reached for the mashed mix of raisins, milk, and oats. She was pretty sure it was the same thing the pegasi ate. Only Robe would give this to a person and consider it a proper meal for a human. What will what take? Ciardis wondered with wide eyes. Whatever it was, this woman was offering two months’ salary for it. Recipe? What are they talking about? Realizing what it would look like if they caught her loitering in the hall, she contrived to look busy by shifting around and sorting the piles of clothes stacked against the far wall. Mags appeared out of nowhere with a curious look on her face, but Ciardis quickly waved her away from the pile of clothes she was sorting. She didn’t want to finish before the conversation in Sarah’s office was over. Mags walked away in a huff. Furiously thinking, the pieces to the puzzle clicked together for Ciardis. Red was a princely dye, one of the few that took skill to harvest and prepare. Ciardis was known across the Vale for her red dye which she made from a combination of mountain plants and one elusive ingredient that Sarah had been trying to drag out of her for years. Ciardis refused to give up her secret ingredient, Mountain Moon Leaf, and Sarah hadn’t been able to devise a substitute. More than anything Sarah loved her money and she knew that as long as she had access to Ciardis’s dye she could charge a hefty fee to individuals interested in getting their garments cleaned in a way that wouldn’t harm the bright red fabrics, which was why Ciardis had been in charge of all the red jerkins yesterday. Sarah had warned her not to let the colors run, but quite frankly, she knew Ciardis’s cleaning mixtures were the best. Sarah was just lucky that Ciardis couldn’t venture out into her own laundry business; the Vale customer base wasn’t big enough for more than one. “That old harpy,” Ciardis muttered after listening to the conversation. Sarah was trying to sell her dye for quite a bit of money and Ciardis was quite sure Sarah had no intention of sharing in the profits either. Nodding, Ciardis backed away respectfully. She was already late for her day’s work. Whirling around she ran down the hallway to the back of the building to the washer station to start her tasks. She’d been lucky that Sarah hadn’t come outside while they were talking. Hours later while fixing the lye for the next morning’s batches, she overheard a bunch of the other girls talking about the mysterious guest from the South. Ciardis carried the large wooden tub filled with the ingredients for the lye outside. Mixing it there was always preferable, even in the cold. The stench would have been horrible in the little mixing room. Lugging it outside she went to the area just behind the steam room filled with charcoal burners. Setting the heavy tub down with a heavy thud, she reached for the solution strapped to her in a round gourd. As she stirred it in a clockwise motion the voices drifted over. Their conversation was just high enough for Ciardis to overhear from the other side of the steam room while the wall between them hid her from view. “Did you see her?” one said in an excited whisper that Ciardis thought was Marianne, the candle maker’s daughter. “She has to be a—” said another voice, but Ciardis couldn’t hear the last word. Has to be a what? She pushed her ear against the wall in frustration, trying to catch as much of the conversation as possible. The three town girls gave Ciardis ice-cold smiles, polite but distant while their eyes flitted over her faded dress, which had large spots where the color had faded away. She returned their greeting and turned away, knowing that they had nothing to share with her. Even though she put on a brave face, she was wishing all the while that she had the courage to ask about the strange woman in their small vale. She wondered who the woman was, where she was from – could it really be Sandrin, and why she was here in Vaneis. That evening, Ciardis gathered her last pound of precious mix for cleaning red dyed cloth and leathers. Carefully weighing it she put it on a small scale and used a stone weight as a countermeasure. One pound exactly. Satisfied Ciardis headed for the Green Inn. There were three inns in town – the one Ciardis stayed in which doubled as a pegasi way station, and another which was a rundown shack with two rooms managed by an old crone and her son. The third inn, the Green Inn, was the one that the rich guests, like the caravan leader, always used. Looking around the main tavern Ciardis made a beeline for Mary after realizing she had no idea where the lady was staying. Mary was the head waitress and one of the few people whom she considered a friend. Tonight was busy – Mary had to continuously jump up to grab the beer and meals ordered by the men cramming the room. After a few quick words and directions from Mary who remembered the woman from her first day at the inn, Ciardis headed up to Room Three on the bottom floor. She knocked firmly on the door. It hadn’t even been latched. It eased open with a creak. Sworn To Conflict, the third book in the Courtlight series is now out. You can pick it up at Amazon, and Barnes & Noble. You can also see it mentioned on the USA Today Happily Ever After blog here. I’m proud to say that this book brings even more twists and turns, action-packed scenes and romance than Sworn To Transfer! But don’t just take my word for it! Check out these new reviews that praise Sworn To Conflict as “devoured in one go”, “jam-packed action”, “couldn’t put it down”, & “left me breathless for more”. After defeating the Shadow Mage from book two, Sworn to Transfer, Ciardis Weathervane touches a silver band that transports her to the war in the North. A combination of depleting her magic and the cold-weather causes her to lose consciousness for three weeks. Luckily, she arrived near the camp of Captain Barnaren, whose medic saw to her health. Faced with war and deceit, Ciardis must decide which side of the confrontation she is on. Terah Edun does it again, with another enchanting book in the Courtlight Series. She has accomplished an impressive task in keeping the series refreshing. Just when you think, you know the characters you find out something new about them. Sworn to Conflict is filled with twists that will keep you guessing. I am looking forward to the fourth book, Sworn to Secrecy, to be released in 2014. This series really does keep getting better! Sworn to Conflict is definitely my favourite so far, and I have a feeling the next book is going to top it. I devoured this book in one go, since I really couldn’t bring myself to stop reading. The plot is jam-packed with action, and there are so many shockers that got my head spinning, especially towards the end. Everything’s turned upside-down in this book, and a lot of relationship dynamics change. At the end of Sworn to Transfer, Ciardis finds herself in the North, right in the middle of the war. This book picks up right after, where Ciardis has been unconscious for the better part of three weeks, her mage core being drained extensively. Ciardis knows there’s something wrong at the warfront, and is determined to find out what it is while simultaneously defending Sebastian. But she soon realizes that Sebastian has grown into a man, and is quite different from who he used to be. Their feelings for each other deepen through their bond, their magic complementing each other. Ciardis also gets to know her brother in this book, and discovers who he’s fighting for. The focus on the kith continues from Sworn to Transfer into this book, and we get to meet a few very interesting ones. I especially liked the frost giant, Inga. She’s tough and bold, and I’d certainly never want to be up against her in a fight! But underneath her rigid exterior, she really does care about Ciardis and does her best to keep her safe. We’re introduced to another new species in this book – the Daemoni. I won’t say much about them, but they’re definitely intriguing and I’m eager to find out more about them in Sworn to Secrecy. Ciardis is as headstrong as ever, and her stubborn nature leads her to some dangerous and astonishing discoveries. She’s always felt alone in the world without a family, and the appearance of her brother means everything to her. She’s desperate to find out more about him and get close to him, if only because they are family. I quite liked Ciardis’s brother, Caemon, so I’m glad they finally found each other. At first I thought their relationship would be something like Clary and Sebastian’s in The Mortal Instruments series, but it’s really not. These two actually care for each other, and Ciardis’s love for her brother is admirable. Sure, the two of them have their ups and downs but I know they can get through anything. Sebastian’s power has definitely grown as well, and he’s downright fearsome in this book at times! I quite enjoyed that. Everything completely changes by the end of the novel, and the build-up of suspense on the very last page left me breathless for more. 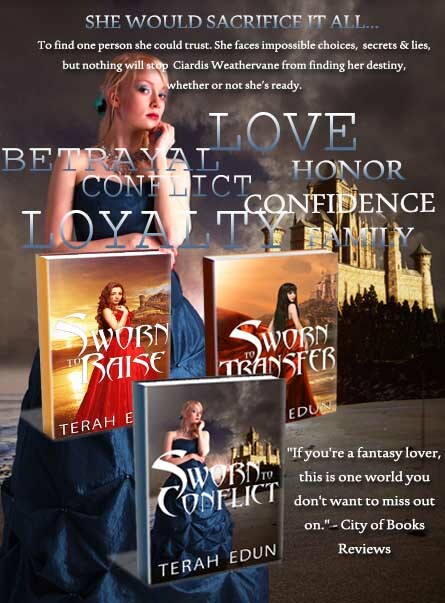 Sworn to Conflict is full of action, with numerous twists and the sweet beginning of romance. I thoroughly enjoyed this one, and I’m really looking forward to the next! Ciardis Weathervane stood on the frozen ground of the North dressed in a too thin tunic and pants while staring around in confusion. Her vision was blurred out and her hearing was a distance echo of an increasingly louder clamor of voices. Men. But she tuned them out. They weren’t important. Neither was the cold landscape beneath her feet and the icy chill in the air. Minutes passed and she stood still. She didn’t hear the men surrounding her as they demanded to know where she had come from or see the frustration cross their faces when she didn’t answer. Her senses were closing off and her mind had gone remote. It was as if everything else was a blur and nothing was real in that moment but the magic in the air around her. A rainbow of colors swirled in the air high above her like banners fluttering in the wind. The colors moved in and around each other freely. First a hue of bright blue like a crystal clear lake on a spring day passed over, next to it the green of a new summer’s grass arced in a playful manner, and then the purple of a weaver’s gown swooped up over the both of them. Gorgeous, gorgeous colors in the sky. She couldn’t take her eyes off the brilliant hues that formed over the icy mountain passes—more ethereal and wonderful than anything she’d ever seen. Minutes passed and she couldn’t ignore her senses anymore as she watched the colors move with a majesty and grace across the arctic sky. Her attention focused on the feeling of nature surrounding her. She heard the whistle of the arctic wind as it wound around the crags of the mountain pass and left her feeling chilled after passing by. She felt the glare of the sunrise above the mountain peaks as its rays shone down on the ice of the mountain passage. Lastly, in front of her she saw the edge of the broad cliff that spread as far her eyes could see to the west and east. She stood close to that cliff’s edge on packed snow. The ribbon of lights wound its way through the mountain pass and down into the chasm below. Taking tentative steps forward, Ciardis walked. She was aware that two men were by her side. They were muttering darkly as she shuffled forward on cold feet. Complaining, she surmised. Within a few steps she made it to the edge of the cliff and she looked down in incomprehension. A startlingly sheer drop-off met her eyes as she watched the ribbon of hued light flow down the chasm to the bottom. It wasn’t the chasm that mystified her, or the depth of the fall. It was the seemingly endless horde gathered at its base. They moved and shuffled and walked with a single-minded purpose. Gray figures that bore metal weapons and leather coverings. Even at a distance it was clear that they weren’t human. She didn’t know what they were. But from the way their backs angled sharply upward with a hunch at its peak and then sloped back down to a small head perched on huge shoulders where long stumpy arms swung forth as front legs in a shuffling gait, they were assuredly kith. It was like a dream. But the feel of ice-cold air and a bright sky uninhibited by a towering forest told her it was very real. She stared around in what felt like delirium. Surrounded on all sides by strange men in an even stranger land. They all shouted their demands. All of the voices had been too much. So she’d turned and run. She didn’t know where she was going. She had never been here before and her feet immediately bruised as they ran across the rough terrain where the soldiers had done their best to clear the snow and packed ice, exposing the rocks beneath. Needless to say, she didn’t get far. But she did manage to escape through the group of men encircling her. It was enough to breach their circle and reach fresh air amid the cacophony of sound. As she sought to comprehend the hordes below her, a tall man stepped firmly into her line of sight and into her personal space. General Barnaren’s intrusion caused her to shuffle back from the edge with chattering teeth. Seeing that she was still in a daze, the man, at least two decades older than her with gray hair and the scars of a seasoned warrior on his face, shook her forcefully by the shoulders, trying to wake her from her daze. It did nothing. She didn’t want to come out. She didn’t want to hear more. She didn’t want to hear from them that she’d somehow transported herself into the middle of a goddamned war. She just wanted to go sleep in the cold night air and wake up in her bed in Sandrin. Snuggled in her covers. Or even the cot in the Ameles Forest would do. “She’s in shock. Call the healer!” snapped the general. He picked Ciardis up, noting her chilled body and her feet that looked blue with the cold of winter as he swung her into his arms. She was too cold to stay out here. To his men, he said, “Have the Healer come to my tent.” Wrapping her in a cloak wasn’t going to do much good. Not in these cold temperatures. Hurrying to his tent, he set her down on the pallet and proceeded to lump as many blankets as possible over her shivering form. “Where’s the damn healer?” he said as he pushed the blankets into a cocoon around her. Anxiously he reached over to his tent chest for the pillow on top. It wasn’t fluffy, but it was what he had. He dropped the offending piece of bedding onto the rug with a guilty look and anxiously backed away. He knew Maris. The female was brash, cold, and impersonal, but also the best healer in the Empire and the only healer he had demanded be placed under his command. Maris swept forward to her patient, ignoring the commander of over three thousand men that she had just casually chastised. Leaning over Ciardis, she couldn’t yet see her injuries. The blankets covered her from head to toe. She reached with a furred hand to take the girl’s pulse at the base of her throat. Checking her extremities would be her next priority. She pushed down the blankets covering Ciardis to reveal a shivering girl with golden eyes, curling chestnut hair, bronzed skin, and a complexion that looked like it was turning blue. As she set to work, Maris murmured soothing words. She poured her power into the girl and turned up Ciardis’s internal heat by pushing her own body’s warmth into Ciardis’s internal organs first and then her extremities. “Have an attendant bring a brazier with hot coals and a teapot. Have them fill the pot with packed snow from the hills before they come,” she said, not taking her eyes or her wandering fingers off her patient. Maris knew that her patient’s fingers and hands as well as her toes and her feet would be the worst off from hypothermia. The extensiveness of the damage would depend on how long the girl had stood exposed in the snow and where the hell she had come from in the first place. Absentmindedly she went over the symptoms in her head while her ears snapped back and forth in concentration. Extremities would always absorb more of the cold quickly, as they laid the farthest from the pump of blood through the heart. Dark or blackened extremities would indicate a patient far gone into a severe case of hypothermia. She leaned forward, her cat eyes glowing in the confines of the tent as she sought to soothe Ciardis’s mind. Even now the girl was delirious. Maris frowned as she felt for the illness that was causing the girl’s delusions. Cold and ice wouldn’t do this. She looked for the culprit with her mage sight. Reaching forward with the blue swirl of her magic, she opened her eyes and looked over Ciardis’s body with the practiced assessment of a hunter. Most non-human races, known as kith, had some ability to use their natural gifts in sync with their magical ones. But none were able to use that union of natural and magical like Maris’s kind were able to. She came from a clan chimeras with highly skilled mage bloodlines, which made her magic intrinsic and natural. Even non-mage chimera were infamous hunters who ran in packs to hunt down their prey. On a hunt skilled mages were necessary, as they could imbue their physical strengths with the natural talent of their magic. This allowed those mage hunters, already fleet of foot with the endurance to run for days and the strength to claw down a white hart elk, to become twice of fast, with the sight of eagles and the individual strength of a dozen of their pride. Their coats grew dense and cold resistant so that even in below-freezing temperatures they were not affected. Their body’s natural strength was increased threefold so that they could go days on the hunt without resting or eating. The pads of their feet were given dexterity so that even on the slick and icy slopes of the mountain passes they could hunt any prey, and their eyes were layered with an extra clear lid that changed their already acute perceptions to a three-dimensional layer of heat. All of this and more were attributes the mage hunters of the chimera were able to use on their hunts. But it was that last magical gift which was the most useful for this patient. Turning on the heat vision, she looked over Ciardis with the assessment of a predator eyeing prey. Chimera would never bring magically or physically ill prey back to their nest or their kits. The mages among their kind could see and assess the illness of the animals they hunted from a great distance, allowing them to avoid the poisoned, the moribund, and the cancerous. As she looked at Ciardis’s body through the slits of cat’s eyes, her mage sight turned her vision from color to shades of gray except where the red of heat signatures lay. One large mass of swirling colors of red was straight in front of her. The burning red and bright orange of Ciardis’s radiating body heat even while the girl shivered from frostbite. The area around her beating heart was the strongest, which boded ill for the rest of her body which shone with less fervor. But she hadn’t given up her fight to live just yet. Maris leaned closer, optimistic for the girl’s recovery. For the most part she was physically healthy, but Maris’s fur lifted up off her back in alarm when she switched from heat vision to an assessment using mage sight. The gift of mage sight was something different. It was an ability she’d learned to use only after being trained alongside human mages. It would allow her to assess the girl’s mage powers after looking over her physical form with the heat vision that came to her from birth. What she saw when she completed the transition made her fear for her patient’s life. A magical malaise covered the young woman’s whole body from head to toe. This one was threatening to kill her long before the effects of winter would push her body to deteriorate from the bite of the frigid air and cold snow. The malaise looked like black nodules, throbbing as they took nourishment from Ciardis’s body and depleted her core. Carefully, Maris prodded the nodules in Ciardis’s body where golden lines from the young woman’s magic were seeking to fight off the illness. The golden lines circled each black nodule in a swirl pushing at its mass as they tried to contain the virulent darkness, but she watched as one after the other the gold swirling lines were drained into the black nodules—much more quickly than she would have expected. Ciardis’s magic wasn’t strong enough to combat whatever the malaise was. As she rose out of her healer’s state, she opened her mind to Ciardis’s mage core and couldn’t halt the hiss of anger which escaped from her lips. The girl’s core looked like a tiny button when it should have been twenty times that size, even for the lowliest of mages. Maris pulled back and wrapped her mind around the fact that this young woman was suffering from magical exhaustion. It was a very rare day when the depletion of a person’s magic extended so far that their body shut down in an attempt to counteract the strange void of an essential part of the body: the mage core. It would explain why she seemed to have such a severe reaction to the winter’s cold when she had only been outside for minutes. Maris sighed and flicked her ears. The girl had depleted her mage core doing who knows what. Or someone else had depleted it for her—a much more depressing thought. Deciding that the best action would be a healing sleep, she firmly but gently urged Ciardis to go into a deeper sleep. One that would prevent movement of her physical form and even dissuade mental activity, including dreams. She watched carefully as Ciardis slipped into a dreamless darkness where her mind would float free of worries. As she observed her progress Maris continued to renew her patient’s body strength, replenish the power source, and smooth the frayed edges of the depleted mage core as best as she could. “With enough rest and plenty of care, the girl’s core will revive itself,” she muttered to herself. Turning slightly, she looked at General Barnaren and snarled in anger. Maris wasn’t feeling too kindly to the fact that Barnaren had been the one with the girl before she came. If he was responsible for her ill health even the gods wouldn’t save him from her fury. She was feeling protective of her patient as a healer should. But more than that she felt furious. Furious that someone had depleted this poor girl’s magic and it had happened under Barnaren’s watch. Maris’s teeth were bared as her lips curled back from long fangs and the orange slits of her cat eyes glinted with fire. The general had fought wars and slew many men on the battlefield. But even he froze in the face of that threat. The tent was too small to back farther away even if he had been so inclined. He was too proud—even in the face of an angry chimera. He looked nervous with beads of sweat forming on his forehead. Maris was one of the best healers in the land, with an implacable nature and a quiet efficiency. But it was well known— a chimera, when angered—was unstoppable. She, like all of her kind, looked like the white tigers of the north, and at times acted like it. Fiercely independent and skillful hunters, chimera were silent and deadly adversaries. Tales were told and all ended the same way – one didn’t encounter an angry chimera and live. And Maris was definitely angry. Her snarl echoed in the small tent as she barely held back the urge to claw him to death. “I have known you a long time, Barnaren, which is the only reason why you do not lie curled on the ground with your entrails spilling from your open gut,” she said. Coldness leeched into his eyes as he faced down the deadly healer who towered above him. She wasn’t in a blood haze – her eyes hadn’t turned red with deadly intent nor had her claws fully descended. But it was close enough, and he would be a fool not to be well aware of how many of his men it would take to kill her if she descended into the blood haze. She would kill without thought or regret for as long as another opponent came forth. All in an effort to protect the young, unconscious girl lying behind her on a cot. With Ciardis helpless and the chimera healer stepping in as her protector, they would all be in danger. “I didn’t drain her. Neither did any of my soldiers,” he said with an assessing look at the sleeping young woman on his bed. He had to know that she would hunt down any person he named. If they were anywhere within the vicinity of the camp, they were a threat to everyone in the camp. Stealing the power of mages was a deadly offense ever since the Initiate Wars and was punishable by death under the laws of the court of the magistrate. Even if they weren’t nearby, she could probably still find them. Chimera were excellent hunters and trackers. Snow and ice were no deterrent. Not mentioned was the fact that Ciardis’s ability to just appear in the midst of their camp was a security breach of epic proportions. Maris rescinded her claws. She could smell the truth on him. “We will,” he said with steel in his voice that promised retribution. Maris turned back to her patient with a flick of her tail. “Out.” It was a command, not a request. He nodded and exited the tent, intent on speaking with his subordinates. As he left, an attendant arrived carrying the brazier with water. Irritation flowed through the healer’s veins at the long wait. “Put it at the foot of the cot,” the healer said with a glance over at the attendant. Before she could snarl at him she noted with approval that the attendant had taken the time to heat the packed ice until steam rose from the confines of the pot. That was good—it would make her treatments much quicker. He did as instructed while keeping his eyes glued to the floor. The whole camp knew how protective Maris was of her patients. Add in the fact that this patient was female and he didn’t want to do anything wrong. He fought to stand still and not back away when the healer came over from her patient’s side. Ignoring the human, who stank of fear, Maris reached into a pouch at her waist and dropped herbs into the boiling water of the kettle. The air soon began to fill with the heady aroma of steamed mint. With a satisfied purr she went back to Ciardis’s sleeping form. “You may go.” The attendant left without a word. Pushing back the covers, Maris hummed a chimera tune that was more purr than melody. Pushing Ciardis’s hair back from her face with a gentle touch, Maris reached into her pouch to produce the ointment. She proceeded to spread the thick paste all along Ciardis’s heart points: her collarbone, her wrists, her ankles, her waist, her forehead, and her chest. It was a steam-reactive treatment that would enhance the magical healing Maris had already produced. The paste started to absorb into Ciardis’s skin even as Maris pulled and pushed the covers back around her body. It would fight any infections that dared to manifest and give her nourishment as her body sought to replenish its depleted stores of energy. Quietly, Maris sat down in a corner, produced two needles and a ball of twine, and began to knit. She settled in with the patience of a mother watching over her cubs. She waited an hour and then checked on the girl’s body temperature again. Ciardis was warming up. Her skin no longer looked so blue in the stifling hot tent. The medicine had also fully absorbed into her body. Maris’s fur was beginning to accumulate water droplets in the heat of the room. But she wouldn’t leave the enclosure or her patient. She flicked her ears back and forth in irritation at the sensation, but otherwise ignored the gathering condensation. At that moment the general returned, clearing his throat to alert Maris. She’d known he’d been coming before his steps had echoed outside the door. From five feet away it was clear that the general, with his distinctive ground-eating stride, was approaching the tent. Her hearing was quite acute. But courtesies mattered—at least to humans. “Please,” she added with a curl of her upper lip. The general nodded and stepped out of the tent once more. After the attendant returned with the necessary supplies, they got to work. They stripped Ciardis of the blankets and added more steam to the room with occasional splashes of water on the hot coals. The attendant attacked the snags in her curly hair, which lay bunched behind her with an assortment of twigs and dirt caught in it. Maris handled the streaks of mud on her skin and tore away the clothes that were already torn with jagged edges, as if they’d been ripped. She must have been in a fight or an accident of some kind. By the time they finished cleaning her off, the female attendant produced some of her own clothes for Ciardis to wear, which Maris gruffly thanked her for, her ears pointed forward in earnest. The woman smiled with a short military salute and left the healer to her work. Two weeks passed before Maris woke Ciardis Weathervane from her deep sleep. Two weeks was a long time. Long enough for a prince heir to assign a team of mages to scour the empire for one lost woman. Long enough for them to find her. Ciardis woke up in stages. Her consciousness came first. Her head felt clogged with a thick fog. One that was slowly fading. She became aware that she was lying flat on her back at the same time she realized she was no longer cold. And then the tingly sensation of her body waking up began to take over, and her senses returned. She twitched her fingers and felt the scratch of rough linens beneath her fingertips. She felt the urge to yawn, but more than that, she wanted to see. The crease between her eyelids felt crusted, as if a long time had passed since she had last opened them. Grimacing, she cleared her lids of the dirt and opened her eyes to gain a glimpse into where she was. It was a dark and enclosed space with very few discernable features. But wait…there was a light at her feet. She strained her eyes against the small glare that felt like a bright sun in her weakened state. But she wanted to see. She needed to know where she was. Taking stock of the feelings in her body, she determined that nothing felt broken or out of place. With a heave she pushed herself up, managing to get her chest to rise a few inches off of the bed. She fell back down onto her back in exhaustion from that small effort. She tried to catch her breath from that small exertion. Then she heard voices. Straining her ears, she couldn’t make them out. They were just outside of the place she was in, but the sound was muffled. She reached above her to touch the moving walls. Fabric. I’m in a room of fabric, she thought with some confusion as she trailed her fingers over the rippling sloped walls above her. But where? The last thing she remembered was confronting the Shadow Mage. She had had run-ins with him as they sparred off and on throughout the weeks of her stay in the Ameles Forest. The Shadow Mage had been unstoppable, killing hundreds of kith even after her arrival at the Ameles Forest with Meres Kinsight, Vana Cloudbreaker, Alexandra, and Terris. The Shadow Mage had always been one step ahead of her, laughing at her antics with a mockery born of cruelty. She’d gone to the Ameles Forest to stop the killings of untold numbers of kith at the behest of the head of the Companions’ Guild, Maree Amber. A woman she had come to learn was also a member of the Shadow Council—a deeply secretively organization in the Algardis Empire whose express purpose was to eliminate threats to the crown. Maree Amber, of course, had died protecting her charge – a rather ungrateful Weathervane at the time. The Shadow Mage had killed another that she considered a dear friend—the golden griffin by the name of Raina. Fortunately Raina had had her kits before her death, so even now the griffin population lived on despite the Shadow Mage’s attempt to wipe them from existence. Unease rippled through her. What if the Shadow Mage had her? But he had died, hadn’t he? She fought down a swell of panic and breathed deeply. She decided cots and tents weren’t really his style; the Shadow Mage was more apt to bind her to a tree with his shadow vines than see to her care and comfort. But she did need to find out where she was. Swallowing a groan, she pushed herself up again, this time locking her elbows beneath her to keep her balance. She had just managed to shift her right leg over the edge of the cot she was lying on when the flap of the tent opened and a roar erupted from the entrance. A dark, human-shaped form stood there with light flowing in around it like a halo. The bright sun threw the form’s features into shadows and kept her from getting a good look at whoever it was. Startled, she scrambled back to the opposite end of the cot and fought to stand. She managed to push her legs onto the floor and stand with a push of her arms. But she only managed that for a few seconds, when her legs promptly gave out on her. She fell to the floor with what felt like astonishing speed. She was lucky her head didn’t hit the cot. After a few seconds, she knew she was too weak to do more than put her arms underneath her from where she lay on the floor and sit up on her knees. She crouched beside the cot, breathing heavily. Ciardis gulped deeply and lifted her head. She didn’t have to look up very far. The creature had come closer. “I am Healer Maris,” she announced as she crouched in front of Ciardis on well-muscled and furred legs that ended in clawed toes. Maris put her hand under Ciardis’s trembling jaw. Maris snorted and her nostrils flared. Ciardis eyed the streaked pattern of the fur on her face with fascination. She wasn’t afraid. She was too tired for fear. “Come,” Maris said as she carefully lifted Ciardis in her arms and placed her back in the cot. Ciardis heard voices—familiar ones—from the tent’s entrance, but she couldn’t see over Maris’s broad shoulders. “You’re a healer?” Her voice couldn’t hide her disbelief. Just then the flap opened as a person tried to push their way in. Apparently a small scuffle outside ensued, because that person was pulled back outside and another person’s head appeared in the opening. The healer had continued to tuck Ciardis back into her nest of blankets. The only signs that she was paying mind to the tent entrance were the curled upper lip that hinted at a coming snarl and the ruffled fur on her shoulders rising in irritation. “I demand entrance,” came a loud protest from the outside. A voice Ciardis recognized and could place even in her tired daze. “Hush, little one,” the healer said. “Sleep.” A command. “I want to speak with Sebastian,” Ciardis protested as she fought the overwhelming urge to close her eyes and drift back into the darkness. She couldn’t fight it, and slowly her body relaxed as her mind went back to slumber. The last thought Ciardis had before she drifted off was, Damn healers. She awoke later. How much later, she couldn’t tell. But she felt stronger as well as grumpy and irritated once she remembered what had transpired the first time she had awoken. This time it was easier, though. Her body felt invigorated rather than achy and tired. She momentarily wondered if it had all been a dream. The cat healer; Sebastian’s voice. She looked to her left when a sound alerted her that someone else was present, and she met the eyes of the healer called Maris. “Friends,” she confirmed. Ciardis wasn’t sure how much this healer knew or even what sort of trouble she’d been dropped into this time. She couldn’t tell her about the secret mission with companions, assassins, and a prince. Not without more information. “Friends that drained you of magic?” said Maris. She was evading the question. “We will speak on this,” Maris said, flashing her sharp teeth. Ciardis had a feeling it was going to be an unpleasant conversation. This healer looked stubborn, like a cat that wouldn’t let go of its prey once it locked gazes with the terrified creature. Maris rose and walked out of the tent with her tail twitching behind her. She returned quickly and helped Ciardis to sit up as she drank down the water with packed snow at the bottom of the cup. The freezing water jogged her memory like nothing else could. Ciardis flashed back to standing outside in the cold air and staring over a huge chasm between mountains. General Barnaren had been there, and he had said she was in the north. She began coughing as she fought off panic at the thought of what that meant. Children in the villages were told tales of horror about the North. Hordes of wild creatures and a vast army that would devour the realm. Spluttering over the water, she turned frantic eyes on the healer, who sat on the cot calmly beside her. The healer’s slanted eyes gave nothing away. She flicked her ears towards the tent entrance but didn’t turn her head. Then someone cleared their throat outside. An announcement rather than a request that they were coming in. General Barnaren parted the tent flap and strode inside. After him came the man Ciardis Weathervane least wanted to see, even while stuck on a frozen tundra and possibly surrounded by hundreds of strange people. “What we like to fondly refer to as the Ice Field, Miss Weathervane,” Lord Crassius interjected with a bit of wit as he bit into an apple in his hand. As Ciardis watched him take a careful bite, her stomach rumbled in hunger with embarrassing loudness in the confines of the small tent. “A stake?” said three voices in confusion. Ciardis shrugged. She didn’t have a better description than that. The object was a metallic silver and covered in runes. She’d been curious about it, that was all. The three adults surrounding her exchanged hard glances. “Perhaps we should get you something to eat first,” said Barnaren with a look at the Healer. Maris nodded and ordered, “Have something brought.” She was speaking to Lord Crassius, but she hadn’t turned around. General Barnaren sighed and pinched his nose. An uncharacteristic action for a man that Ciardis knew as stoic. Ciardis watched the pair with surprise. It looked as if the general was actually avoiding the eyes of the healer beside her. He’d turned his head aside and wouldn’t even look in the healer’s direction. Sure, she was a kith, a cat woman with claws to match, but he couldn’t be afraid of her, could he? Ciardis turned curious eyes from the general to the healer. And then she reassessed. The healer’s fur stood on in and her eyes had narrowed into tiny slits with glowing chips of orange fire in them. Her claws had descended from their retractable sheaths and her lips were fully curled back to reveal her bared teeth. Yes, he could very well be afraid of her. Ciardis was certainly terrified. She caught a glimpse of Lord Crassius out of the corner of her eye. He stood at the entrance watching everyone with the casual elegance with which he watched everything, as if it were all a spectacle for his enjoyment. A glint was in his eye, and she saw a half-smile on his face as he contentedly munched on his apple. Spoiled nobility didn’t know danger when they saw it. The general turned uneasy eyes on the girl sitting in front of him primly with her dark hands folded in her lap and riotous curls ruffled charmingly about her head. “His Imperial Highness Prince Sebastian Athanos Algardis, Lord Chamberlain to the Emperor Richard Steadfast, Lady Arabella of Nestor, and Lady Mage and Companion Vana Cloudbreaker,” the general answered shortly. Ciardis blinked at the assembled party that awaited her. She felt uneasy. Unease where she should feel joy upon seeing Sebastian. His betrayal still hurt. He had lied to her about her family, about her brother’s existence, and had kept that knowledge from her. Those were the highest sins in Ciardis’s eyes. She had grown up an orphan in Vaneis. Alone except for a few ‘strategic’ friends, more like spies, such as Mags, the girl who had told her about her former beau’s infidelities. All she had ever wanted was a family, but she had learned early on that no one in the village wanted her. She had been nothing. A burden on the villagers, an abandoned orphan with no home and no family. Until she was seven, she hadn’t even been able to start paying the villagers back for the food and grain sacks she slept on. She bit the inside of her cheek in indecisiveness. She didn’t really have a choice, though. Carefully she placed a hand in the crook of his elbow and stood on slightly trembling legs. She may have been sleeping for three weeks, but she still felt exhausted. She steadied herself and raised her head high. It wouldn’t do to appear weak. 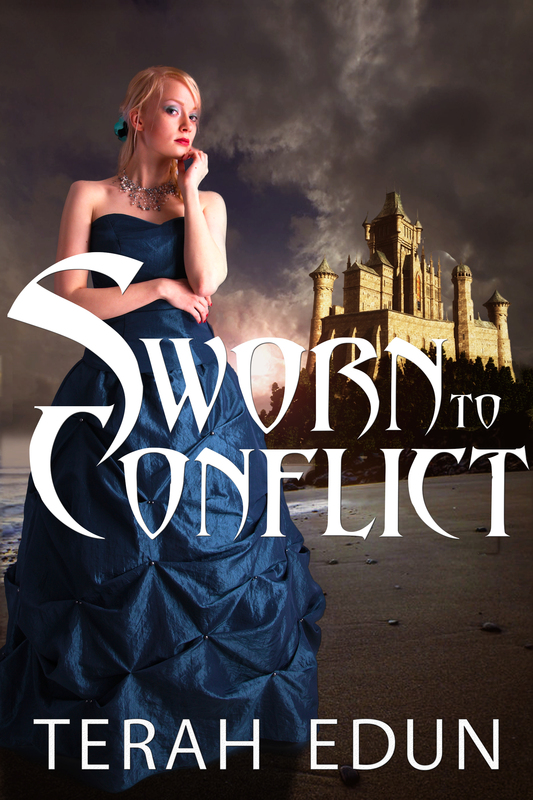 Sworn To Conflict is LIVE!! The official release date for Sworn To Conflict (Courtlight Book #3) is December 6th. There will be a 48-hour super sale where Book Three in the Courtlight series will be offered for $0.99c during the first 48 hours of release! That could mean anytime between the 4th and 7th. Watch my website for the announcement or sign-up for the new release list today. On the last day, Sworn To Conflict will go to back to its regular price of $3.99. An ebook Boxed Set will be available for purchase starting December 15, 2013. The Boxed Set will contain Books 1-3 and will be on sale for $6.99. It’s a perfect gift for a young adult fiction reader new to the Courtlight series, so think about sending it as a Christmas gift. I’ve partnered with an amazing group of Young Adult authors with bestselling series in Paranormal, Romance and Fantasy. We’ve come together to release Dangerous Shades Of YA, a six author book bundle with the starting books of our series. You can start this bundle today, which includes Sworn To Raise, for just $0.99 on Amazon and Barnes & Noble. For anyone wondering about the release date of Book #4, I am hoping to have it ready for release in February 2014. A very special thank you to all the beta readers who read and returned feedback for Sworn To Conflict. You are seriously fantastic and your comments have helped iron out the story! !